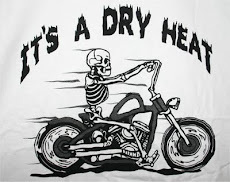 Desert Home: My Barometer, and Tips and Tricks With XBee Device Code. 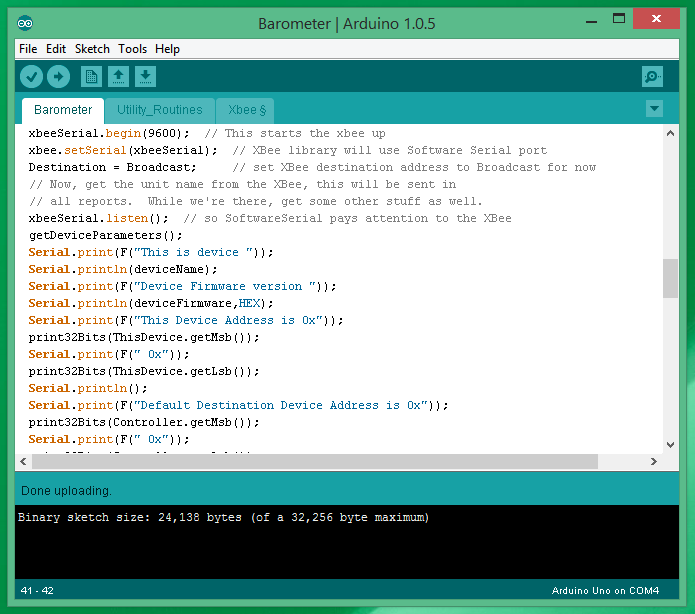 My Barometer, and Tips and Tricks With XBee Device Code. In the last post <link> I put together a basic barometer to substitute for the silly one on the AcuRite console that came with my 5n1 weatherhead. My XBee shield still hasn't come in, but I got a wild hair and decided to go ahead and put together the code while I waited. As I was stealing pieces from various other projects I've done and combining it to implement this latest one, I realized there was a significant piece of code I haven't shared yet. Early on I got tired of having my XBee set up wrong because I forgot something when I configured it and created a little piece of code to check the configuration to some degree at boot time on the Arduino. By sending AT commands to the XBee, you can check things like software version, operating mode, etc. Then if something was messed up, you can correct it easily without a long debugging session to discover some minor setting error. I also use this to get the name of the device, and the address that it normally sends to. Using this piece of code makes the entire device more configurable. For example, you need to change to broadcast, instead of a specific address, to monitor the packets, just use XCTU to remotely change the DL, DH attributes and reset the Arduino so it reads the new address. If you decide to change the device name, remotely change the NI attribute, and again, reboot the arduino. I've been using this in one form or another now for a while to help work the kinks out of the latest device I'm working with. Yes, you can change the configuration of the XBee that you stuck in the corner of the attic remotely, This has been a capability of XCTU for a long time, and the latest version of XCTU makes it even easier. To remotely reset an Arduino, I simply decode a command I send and then call location zero. These two tiny tricks makes minor changes to the network really easy and can be done from my recliner. The code that follows (below somewhere) is a simple thing with complete XBee interaction, I have examples of sending formatted strings containing float data through the XBee, parsing a long unsigned integer out of an XBee message and using it, simulating the data portion of an XBee message for debugging, setting up a timer to send status periodically, reading some of the configuration out of the XBee to be sure it's OK before continuing the work. That kind of thing. Since the barometer code is so easy to understand, I thought that would be a perfect device to put all this stuff in and use as an illustration. Go take a look at the barometer <link> then come back here and I'll step through some of the things that you can use in your own code to make the XBee a valuable device in do it yourself home automation. resetFunc(); //This will reset the board and start all over. Yep, that's all there is to it. I use this a lot for overcoming memory leaks in libraries that haven't been tested long enough, memory loss from using Streams in c++, that kind of problem. It also helps overcome my own bugs from time to time. As an example, in the code below I use it twice. I have one software reset that is on a timer to reset the board every day around midnight. This is to recover memory lost to whatever code does a malloc() and then doesn't remember to do a free() to release the memory back. This is a very common problem (called memory leak) and has plagued tiny computers as long as they've existed. When you want to run an Arduino 24/7, you have to code defensively. The other instance is when I send a reset command over the XBee network to cause the board to reset. I use this to test things like power failures, how long it will take to settle down, and to see if a reset will work before I get the ladder out to take a physical look at it. Since I mentioned remotely resetting the board, I'll describe how I do that, but I need to explain how I use the IDE itself first. 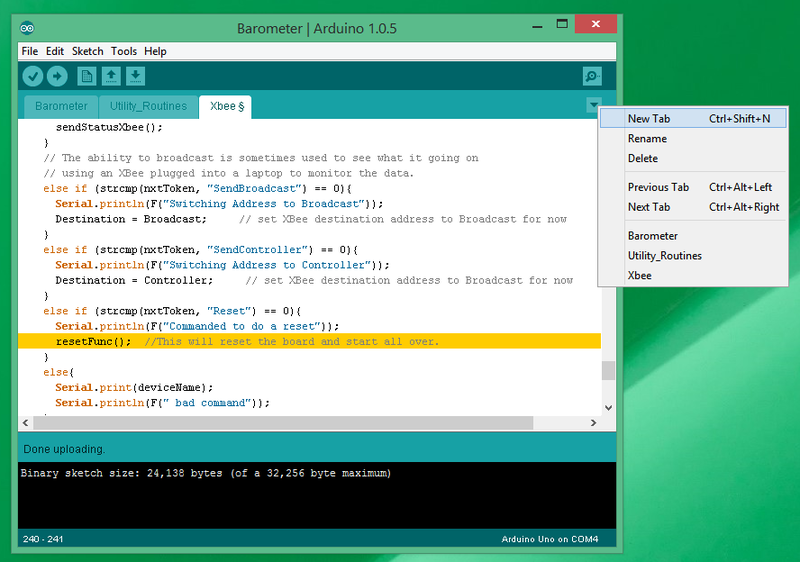 Most of you already know that the Arduino IDE supports 'tabs', but the new folk haven't caught up to that yet. Tabs are actually separate source files that the IDE stores in the same directory as the sketch. These are extremely nice for organizing code so you don't have to scroll through a couple of hundred lines of code to get to something you want to work on. What you're looking at above is the Arduino IDE with three tabs. One is for the bulk of the barometer code, the next is for some utility routines I use a lot, and the one selected is the XBee code I use on a lot of my devices. I opened the window that controls tabs so the new folk can get a look at the tool provided for working with tabs. Remember, each tab is actually a separate file in the sketch directory. When you compile something, the files are all concatenated together and passed to the compiler, this is just a convenience to help you organize your project. There's a couple of tutorials out there that mention tabs, and I've heard of a book or two that do, but most of the instructions are great at telling you how to install it, but not how to use it effectively. So, don't be afraid to poke around and experiment. No, I'm not going to write a book about it. If I did, they'd change it and I'd have to have a second revision. I've got projects to work on instead. I can type that right into an XCTU session from my recliner and the barometer out on the fencepost (where it will eventually reside) will reset itself. Yes, I have to construct a packet in API mode 2 format, but XCTU has a packet generator that works pretty well to help with that. I know, it's a dumb screenshot. I did this on purpose, to illustrate again how tabs can work for you. I have selected the barometer tab and scrolled down a bit to the setup() routine. See how you can flip between tabs to do things instead of scrolling though tons of lines of code and losing your train of thought? I like this feature. It's not perfect code, and it doesn't serve the 'general case', but it is easy to understand and does the job. Notice in the routine sendAtCommand() that I hang up in an infinite loop waiting for a response to each AT comand I send? Yes, that's on purpose. See how the name of the device, long address, version, destination long address can be gathered directly from the XBee? This is nice to guarantee that you set things up correctly when you try your code out. I use sprintf() because the documentation is all over the web and there are tons of examples out there for people to follow. The problem is that the Arduino sprintf() doesn't support floating point, but does have a handy routine dtostrf() that will turn a float variable into a nice little string that can be used. Pay particular attention to the format string I used; you don't have to do it this way. You can assemble any string you want to and send it instead. Like I said though, JSON is already documented on the web and I don't have to invent anything this way. // using an XBee plugged into a laptop to monitor the data. This fragment will allow me to type a command that would normally come in over the XBee right into the IDE serial monitor and send it to the code. It does this by just gathering the characters and calling the same routine I use to decode XBee commands. This cuts short the time it takes to add another command to the device. Now, normally, I would post the code of the entire module, but I bet you've had enough code samples in windows for one session. Instead, I finally got the Arduino code I'm using for the various things into GitHub. This entire module is in the 'Barometer' directory so you can grab it and modify away. It's been running for a few days and hasn't blown up yet, but I'll certainly be adding to it over time. If you go looking in the other directories don't expect all of these features to be in each thing. Like I said, I developed these tricks over time and only recently started to go back and update the older devices. Heck, I haven't changed the thermostats at all in months. One of the modules hasn't even been compiled under an IDE version in a couple of years. I'll work through the devices one at a time as I have the chance, and probably come up with another trick that I'll want to fit into the others. It never ends. Here's the link to GitHub <link>. Have fun. I'd just like to say thanks to you for publishing this blog, with all of your information and code. It's been a great inspiration, since I found it, for me to get of my a&* and do something similar, though much less comprehensive. You're welcome. It's fun when I occasionally hear about other folk that have used something in their own house.I've also had folk find bugs for me, suggest better ways to do things and point out a new piece of hardware I never heard of. So, when you get something going, let me know. or do you need to send two separate JSON strings, one of floats and one of integers? Yep, you sure can. That's one of the great things about it. Hi Dave. It's been a while but I saw that there are now Series 3 XBee available that can run as both a S1 and S2 depending on what you load on it. Ever had a chance to try that out?